"Specifically, baseball pitchers need a period of "active rest" after their season ends and before the next preseason begins. During active rest a pitcher is encouraged to participate in physical activities that do not include a great amount of overhand throwing." 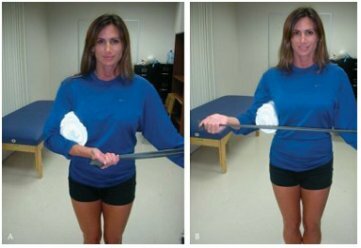 WHAT SPECIFIC EXERCISES CAN HELP PREVENT SHOULDER INJURY? "Preseason weakness of external rotation and [supraspinatus muscle] strength is associated with in-season throwing-related injury resulting in surgical intervention in professional baseball pitchers." How Do I Strengthen My External Rotators? I much prefer weighted jumping rope 3 minutes per day (in 3 1-minute sets) for 8 weeks as it's MUCH more functional and can increase your rotator cuff external rotation strength by as much as 55! (click here for the study or you can click here for the newsletter). How Do I Strengthen My Supraspinatus Muscle? The supraspinatus plays a very important role in slowing the arm down after ball release (called "deceleration"). As a result, it's one of the most stressed rotator cuff muscles. "...the full-can exercise may be best to maximize the amount of supraspinatus activity with the least amount of deltoid muscle activity."